Paint Out Norwich 2018 saw over 275 works of art created by 35 artists, each in 2-4 hours, around 7 iconic locations, and across 4 days of extreme weather, first an Indian summer then freezing downpours for two days, then a return to sun and dry. The 14 prizewinners were sponsored by Leathes Prior Solicitors as well as a local interest prize from Norwich Art Supplies. Wednesday night saw the Private View and Awards event decked out with Paint Out‘s distinctive contemporary, white-walled shelving, that allows the some-still-wet artworks to be displayed fresh, raw and unframed. Well over a dozen paintings were sold in a short buying spree before the award announcements. 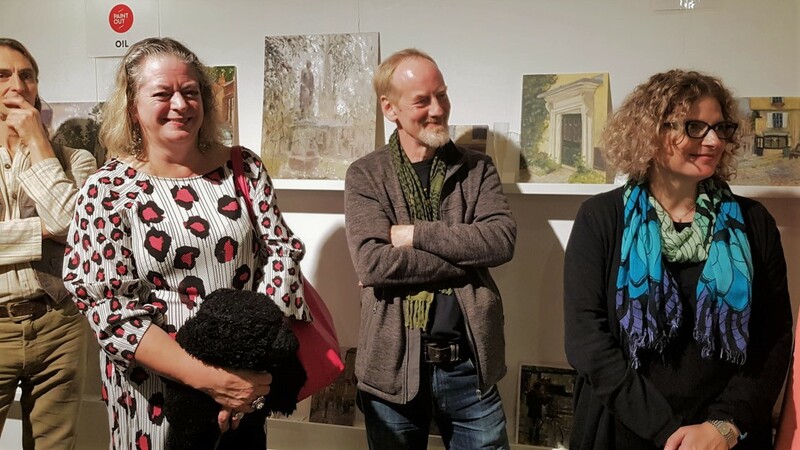 The judges on the night, from the fields of art practice, art history, and fine art sales, were Dr Giorgia Bottinelli, curator of historic art at Norwich Castle Museum and Art Gallery, Sarah Flynn from Cheffins Art Auctioneers, and artist Tony Robinson of Art in the Open, Ireland. 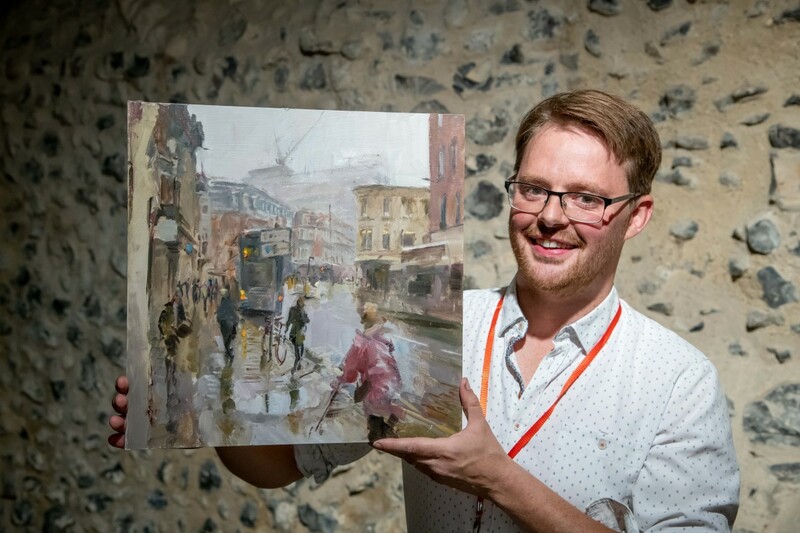 Paint Out Norwich Awards 2018 – Rob Pointon, First Prize. Photo credit ©Simon Finlay Photography. Paint Out Norwich Category Winners 2018. Photo credit ©Simon Finlay Photography. First Prize: Rob Pointon, “Changing Skyline”. Second Prize: Roger Dellar, “Light Coming Through the Market”. Roger last painted at Paint Out in 2016 when he also won a prize. Third Prize: Sarah Allbrook. 31-year-old Paint Out first-timer Sarah is based in Cambridge but trained at NUA in Norwich. First Prize: Shaun Carey, “Norwich Market 1”, painted on the first morning of the 2018 event in his stand-out trademark dark blue acrylic style. Second Prize: Wendy Kimberley,”Wonky Bridges of Norfolk County”. Fresh from winning En Plein Air Windsor & Eton, Wendy picked up a deserved second place with a dark-styled acrylic daytime painting of St George’s Bridge by NUA. First Prize: Alfie Carpenter, “He Shall Not Be Moved”. Marking a successful return to the competition despite a little opposition, on health and safety ground, to so many artists painting Anglia Square – hence the painting title! On the Awards night, he sold four paintings within minutes! Second Prize: Tom Cringle, “The Memorial”, on St Peter’s Street at the top of the Market. Tom is now a regular Paint Out winner and continues to push his work in new directions at the event. 2018 saw the return for the fourth-time of the popular and innovative nocturne – evening/nighttime painting category that sets Paint Out apart from other competitions. First Prize: Susan Isaac, “Up The Steps”, painted from the rear of St Peter Mancroft with its eerie gothic feel late at night lit by a single street lamp. Second Prize: Paul Alcock, “Thorns by Night”, on Pottergate, a now classic local nocturne view with the warm orange glow of its nighttime lighting. Unilever Colman’s Prize winners. Photo credit ©Simon Finlay Photography. Marking the winding down of Colman’s production operations at the historic site and brand with a heritage stretching back over 200 years, Paint Out was granted access to the early 16th-century Grade I listed Benedictine Priory, Carrow Abbey and its 12th-century ruins on site. Carrow Abbey has been the subject of a number of notable paintings including “the Carrow Abbey hunt”, by the artist Philip Reinagle in 1780. We are grateful to Unilever for two engraved silver Colman’s mustard pots that were presented to the winners. First Prize: Alex Atkinson, “Rising from the Ruins”. 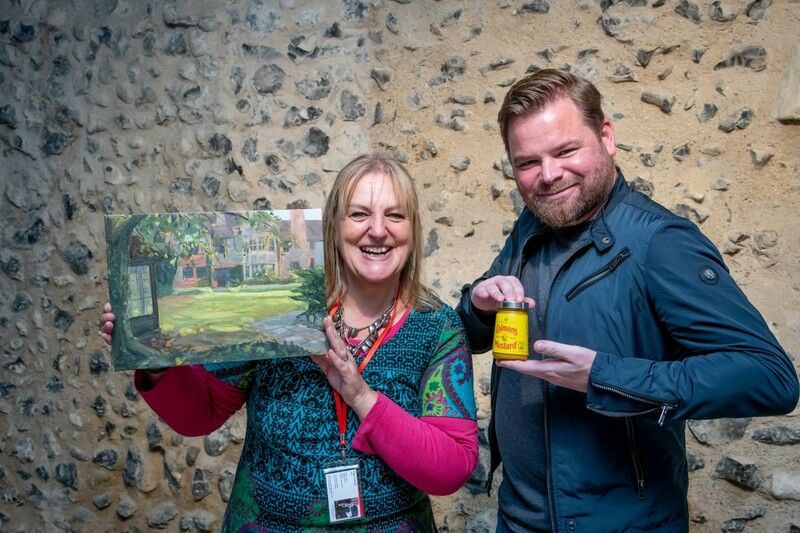 In 2017, Alex won the Spirit of Norwich Prize at Paint Out. Paint Out Norwich Awards 2018 Spirit of Plein Air, John Behm. Photo credit ©Simon Finlay Photography. 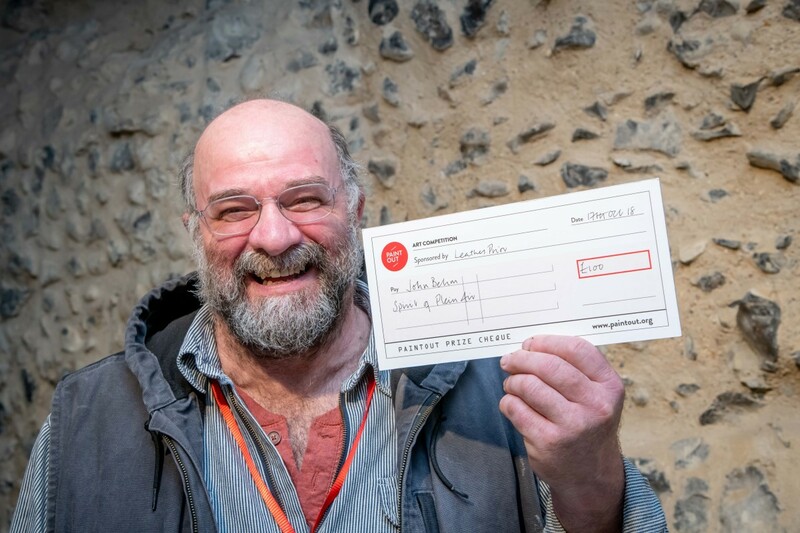 The Spirit of Plein Air award once again went to Taverham-based American artist John Behm for his braving a plunge into the River Wensum by scaling Fye Bridge, in order to rescue another artist’s work and easel! 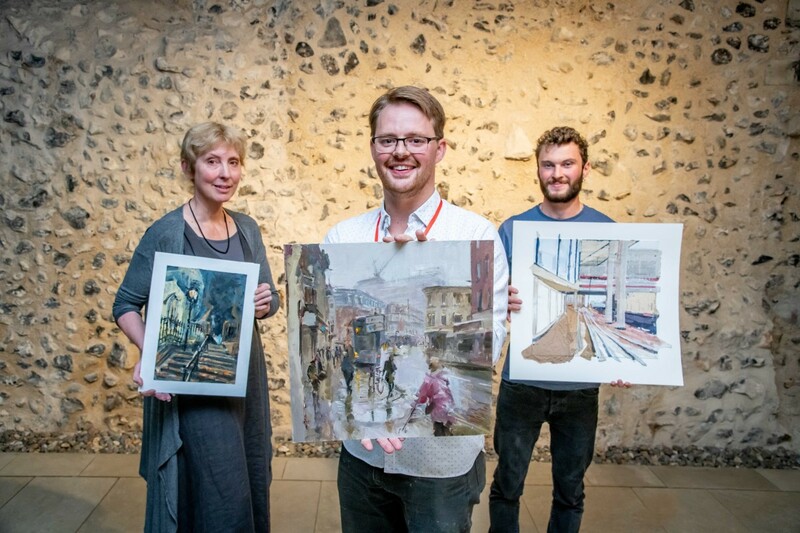 A further prize, the Spirit of Norwich, sponsored by Norwich Art Supplies was awarded to Hannah Bruce for her diverse collection of artworks of Norwich in various media and styles. The People’s Choice Exhibition vote went to Sarah Allbrook, who also won the Third Prize in Oils and sold very well at the Exhibition. The paintings remain on view at the Norwich Cathedral Hostry as part of the Hostry Festival and Paint Out exhibition until 28 October. Last year some 8,000 people saw the 150+ paintings of 2017, with dozens of artworks selling.